Im still getting philly channels. Watched the Sixers game tonight. Where is this message you guys keep talking about? I'm still getting (some of) them too, but I have about 55 days to log in from Philly or they cut off the Philly access. Here's the message in a Web Browser. It's basically the same on my Roku. Weird. Haven't gotten that message. Im viewing via PS4. When you signed up did you use a Philly address? I used my parents address. Of course the message comes on now. LOL. I have a VPN. Closest server to Philly is Wilmington. Going to have to change my stuff up and see what happens. OR should I cancel my subscription and sign up while logged in to the Wilmington server? Let me know what you think. I'd log out, then start your VPN and log back in. See if it works. How many miles is Wilmington from Philly? Is it in Philly's TV market? I'm not overly familiar with that area. If it works, I'll check to see if I have Wilmington in my list of possible servers. I've signed up with a couple of VPN's, one that I've had for a year, the other I've only had for about a week. I did a chat with support on the one where I keep showing up as being in Charleston, even though they're Philly servers, and he seems to think that's because PSVue is using an outdated database. So maybe it will eventually work. If it does, it requires jumping through a couple of hoops, but I think it may be worth it if it works. With Hulu, I may have found a way to make it work. You can't watch any content while the VPN is on, but when I start Hulu and they want to verify my geolocation, I have the VPN on with Philly as my server. So I let them Geolocate me. Once that's done, I turn the VPN off and I block them from being to geolocate me again. I can then watch the content that I want from the Philly channels. So far, after 5 or 6 hours (maybe 8 to 10), they wanted to geolocate me again but since I had them blocked, I couldn't access any content until I unblocked them. So I turned the VPN back on and I unblocked them and allowed them to verify my location. That done, I blocked them again and turned the VPN off and I again had my Philly access back. All of this is on a PC. I don't know how I'll do all this on my Roku, if I can at all. But for now, it's working on my PC and if that's all I can make work, so be it. Wilmington is pretty close. 32 miles according to google. Its in the Philly local range. Especially for regional sports broadcasts. I logged in last night after I changed my VPN location and was able to watch without that message popping up. Tonight I get a connection time out. Hmmmm. I'll keep trying. Who is your VPN provider? Well, so far my 'work around' method on Hulu is working. I'm using CyberGhost because it has Philadelphia servers. 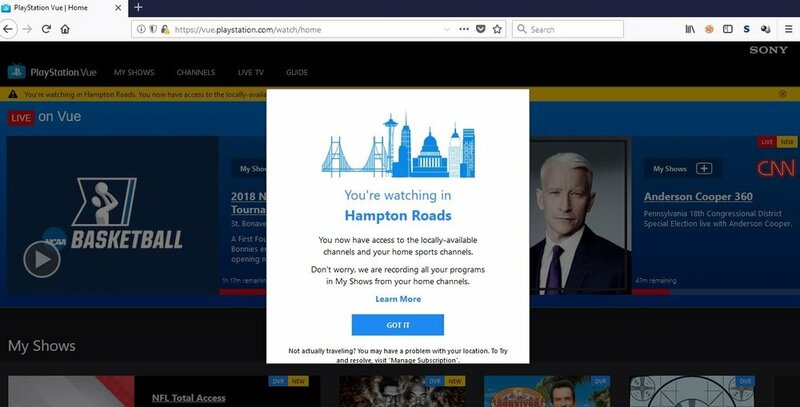 Unfortunately, when I try to log into PSVue, they see me as being in Charleston, SC. But apparently, Hulu sees it as Philadelphia. I log in through Chrome with the VPN on, it asks to see my location, so I allow it. They see I'm in Philadelphia and allow me to gain access to the content. I then immediately block them from seeing my location and then I turn the VPN off. Once that's done, I can view the content 4 or 5 hours later, they want to see my location again, so I have to turn the VPN back on and unblock them and do the same process as what did earlier. A bit of a hassle, but if it's the only way to make it work, so be it. It's actually pretty simple. Just a matter of clicking a program on or off for the VPN (Virtual Private Network), and then allowing or blocking access to your geolocation in Chrome. If it comes to the point where you need to do this, I can do a step by step for you on what to do. Well I use a WiFi hotspot. Is it still possible to do that?? Using a PC or Laptop? You should be able to. I can't say positively, because I've never done it that way. But I don't see why it wouldn't work. I signed up for a month, to test it. Do you get the local Fox, CBS, ABC and NBC? I don't see them on mine. i'll try again tonight. Will let you know. It did pop up with the message that I was in Wilmington. So if Wilmington gets different locals, then that may be why. Damn...then it looks like I'll have to cancel and sign up again. BUT they are Philly regional when it comes to sports. So a Fox broadcast is going to show the Eagles when they don't have a national game. That's what matters. We just have to get the PSVue to not give us that stupid warning. If I get the Philly games and NBC Sports Philadelphia, that's really all I care about. The effort you guys put into this is amazing and I’m not being condescending when I say that. My girlfriend is a Patriots fan (I know, I know) and only uses streaming services at her place. I was going to use the strategy that was discussed in this thread to make it so she could live stream Pats games next season but I see PSVUE has caught onto which I had anticipated. 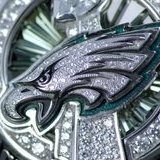 I have a two year contract with Comcast that expires 8/2019 so im set for next season but I’ve been wondering how long it will take to legitimately flawlessly live stream regionally broadcasted Eagles games. Using a VPN, you could do it. One of the ones that I tested, has Boston servers and on PSVue, they see it as being in Boston. So she would get the Boston locals. The problem that we have with the Philly locals is that PSVue thinks that the Philly servers are in Charleston, SC. Weird, but if the IP address showed up properly, I'd show up as being in Philly. I'm sure there's a VPN out there with Philly servers that will show up properly, I just have to find it. I still don't understand why this is an issue. If I want to pay more to watch out of area programming, wtf do they care? Exactly. Viewership would go up if you could watch what u wanted without all the hassles. It's all about local commercials (I believe). If I'm watching Philly TV and a commercial for a car dealer comes on, or a furniture store, they mean nothing to me because I'll never, ever shop at those locations. But if I'm watching local Hampton Roads TV (where I live), then there's more of a possibility that I'll go to those stores or dealers. What they need to do is figure out a way to give me Philly TV with local Hampton Roads commercials. Plus I'm sure it has to do with the regional broadcast areas. I live in 'Redskin territory', with regard to Fox broadcasts. So getting Philly locals, I'm bypassing that. I am a highly skilled couch commando, I don’t watch no stinking commercials.